Hi friends. Many of you have had questions about the spaceship-like thing that I posted pictures of Jude and myself in on facebook yesterday. Instead of answering questions in a dozen different places on facebook, I thought a blog entry would be more helpful. Hyperbaric therapy originally started as a way to help divers recover from decompression sickness from surfacing too quickly. You know that feeling when you go to the bottom of a deep pool and your ears pop? That's because the pressure of the water around you gets stronger the deeper you go under water. If you've ever been at a really, really high altitude, you may have gotten lightheaded and sick because the pressure of the air gets weaker the higher you go. Changes in air pressure change the way our bodies process gasses like oxygen. When there is more pressure, more oxygen is allowed into the bloodstream. Anyway. Hyperbaric therapy is useful for treating an array of physical injuries and chronic conditions like anemia, carbon monoxide poisoning, gangrene, crush injuries, abscesses in the brain, diabetes related circulation problems, and more. It also helps patients with brain injuries from stroke or trauma. The man who owns the chamber we are renting said he actually got into hyperbarics to treat bed sores for morbidly obese people. As the video explains, it's been discovered that people with autism have significantly reduced blood flow to the brain, as well as inflammation of the brain. 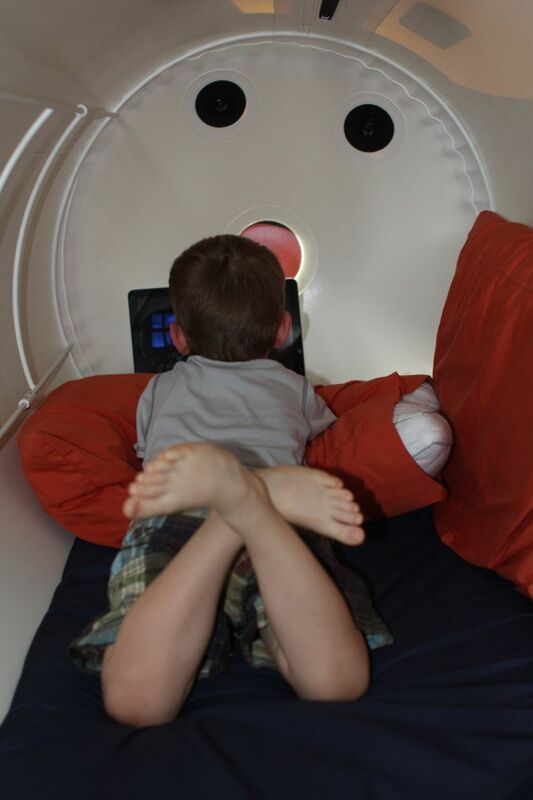 Hyperbaric therapy helps with both of these (more details here), and, although hyperbaric therapy for the treatment of autism is still relatively new, it is making a big difference in many families' lives when used along with other traditional and biomedical interventions like speech and behavioral therapies, diet changes, supplements, etc. Several friends have asked how long he has to be in there. There are different recommendations, but we are renting it for 30 days and will be doing at least 40 sessions (called "dives" from its origin treating divers) during that time. Our chamber is big enough for one of us to get inside with him, and we can also take electronic devices inside, so he will probably watch Veggie Tales or sleep during most of the dives. It's quite comfortable, with a big cushy pad to lay on, although it does get a little warm in there. It's large enough for me to sit up comfortably, and when I lay my 5'2"self down flat, I only take up about 3/4 of the length. In order to get more oxygen, there is an oxygen concentrator and he is supposed to wear a mask. If you know Jude, you know how well that goes over. That's why we are trying to do as much of it as we can while he is asleep. I am able to hold the mask a few inches from his face and let it blow on him, which isn't too bad, but it's best with the mask all the way on. Well I really need to get busy. Hopefully that will help you understand! If you have any other questions, feel free to leave them in the comments and I will try to answer them as well. 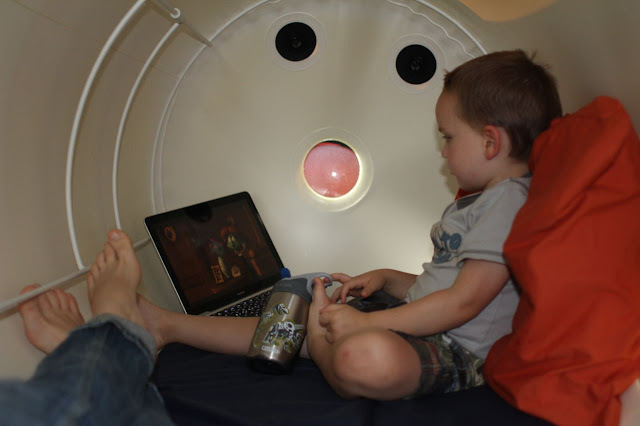 I did hyperbaric oxygen treatments when I was really sick with Lyme disease and they were very helpful! So glad you can do it for Jude!